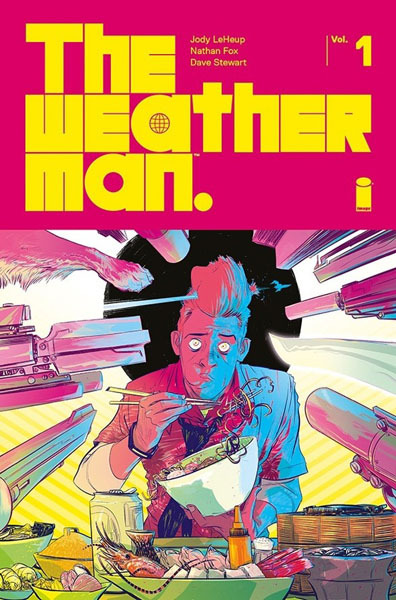 Collecting the first six issues of the series by writer Jody LeHeup, artist Nathan Fox, and colorist Dave Stewart, The Weatherman scratched our sci-fi/action/adventure itch better than anything has since Schwarzenegger's big-screen heyday. But Fox's art—which is like a more frantic Paul Pope, maybe—is so much better to look at than the Governator. And LeHeup's story, which concerns a man who, at least to start, is a weatherman on Mars, where the bulk of the surviving human race seems to live—is densely packed with more intrigue, characters, factions, and twists than most movies could dream of pulling off.